One of my favorite things about people in general is that no matter how much we think we can circumscribe ourselves or others – a student, a lawyer, ENFJ, type A, typical youngest child, Irish, Korean, spiritual, poetic, athletic… – we are all still full of the most wonderful, quirky contradictions. I have friends who are quiet and unassertive but extremely self-assured, who are the life of the party but are really introverted, who are homebodies but also world travelers, who cook gourmet Turkish food but can’t pass up the chance to eat a hot dog. It keeps things so much more fun than if we were actually predictable. For myself, I’m a reluctant, grouchy morning person. We were at some friends’ wedding this summer, and in one of the speeches the bride was described as being able to wake up and spring from her bed, beautiful and sunny like a Disney princess ready to call all the woodland creatures to her with a song. Yeah, that is reeeeeaaaally not me. I pry my eyelids open a millimeter at a time in response to the wretched beep beep beep of my alarm. I fumble for clothes, run into things, groan. I have been gently informed that I’m basically an irrational, slightly testy, mess until I have my cup of coffee. But at the same time, I wouldn’t miss the morning for the world. It’s absolutely my favorite time of day, quiet, full of potential, full of breakfast. I love breakfast! It’s kind of weird and embarrassing, but I actually go to bed looking forward to breakfast the next morning. It doesn’t matter if breakfast is just a simple piece of toast and some yogurt, I still get excited for it! And if it’s a good breakfast, well then I’ll definitely haul myself out of bed, bleary-eyed and slow, but ready to face the day with fork in hand. I’m open to all variety of breakfast, but one of my favorite special breakfasts is rice pudding (or rice porridge, whichever you prefer to call it). It’s quick enough to make that you can do it on a weekday, and it’s also a fabulous way to use up leftover rice. I lived with one of my best friends senior year of college, and wild rice porridge with dried fruit was a staple for breakfast in our household – on a side note, another of our dearest friend’s husband may never forgive us for forcing him awake at 6 am to join us for a bowl of the steaming porridge, though I think he came close to being okay with it once he tasted how good it was! This version that I made uses basmati rice which I love for its lightly fragrant flavor, but you can really use any sort (including brown rice or wild rice, which will lend it a delicious nutty flavor). You can make rice porridge with just milk or cream, but I like to add a couple of eggs to give it a thicker, richer texture, and for extra protein. I use honey or maple syrup to give it just a hint of sweetness, and then I either add dried or cut fruit or, when I really manage to work up some gusto, I make a quick fruit sauce by sautéing some seasonal fruit in butter and adding a touch of honey or maple syrup to that as well. I had never tried using figs before, but I discovered them on sale at the grocery store. They added a wonderful deep sweetness and unique flavor, and their brilliant pink color on the inside is so lovely I almost wanted to shellac my breakfast and turn it into a piece of art! But, I was too hungry for that. To make the pudding, combine the rice and about 1 cup of milk and the honey or syrup in a saucepan, bring to a simmer and simmer for about 10 minutes until it has thickened. In a bowl, whisk together the remaining milk, the eggs, cinnamon, salt, and vanilla. Stir this into the cooking rice, stirring well. Cook the rice for 5 or so more minutes, stirring very frequently until it is thick and hot. Add more honey or maple syrup if you’d like it to be a bit sweeter. While the rice is simmering for the first 10 minutes make the fig sauce. In a small skillet, melt the butter and cook it until it has turned brown and has a nutty smell (about 5 minutes, I’d guess), stirring frequently to scrape any browning bits up off the bottom. Add the cut figs and the honey or maple syrup, stir to coat the figs, and cook for 3 or so minutes, stirring occasionally until the figs are well coated with the sauce and have become soft. 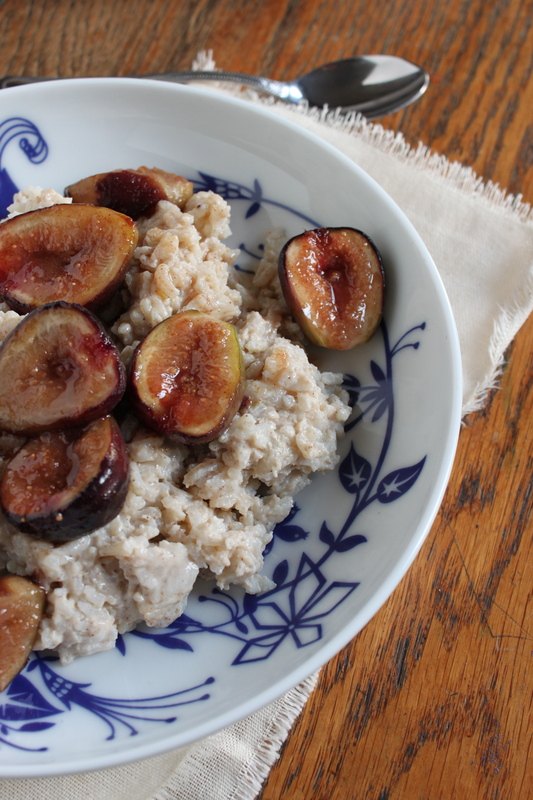 Divide the warm rice pudding into bowls and spoon the figs and any remaining glaze over it, and enjoy with a nice hot cup of coffee. Rice pudding, of course, also makes a perfectly splendid dessert! i added your blog to google reader a few weeks ago, so now i feel like i finally know what you’re up to! this post is lovely – i wonder who the gourmet chef / turk / hotdog lover is? 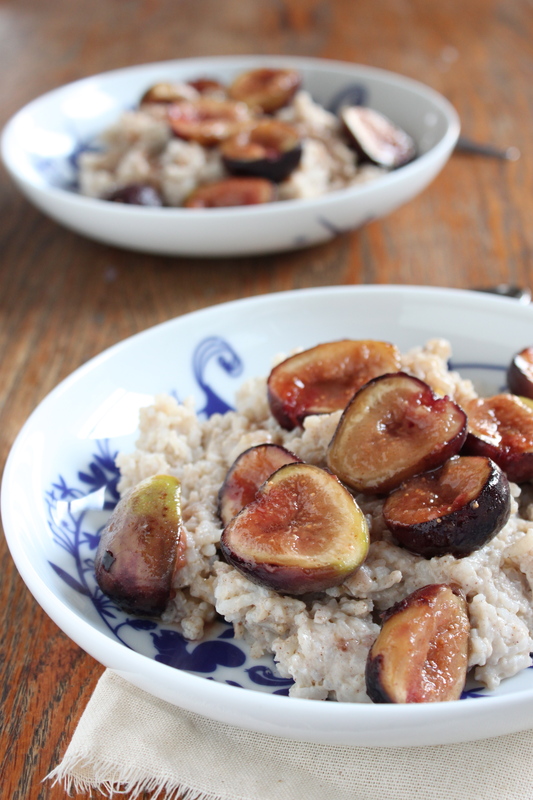 we have a pile of figs at home, so i plan to make this tomorrow. and remember the early morning rice pudding fiasco in northfield when ry and i came to visit. he won’t let me forget it! Thanks Kels! It makes me oddly happy that he remembers that early morning rice pudding with almost the same vividness as being “force” to jump in the lake. Enjoy your figs! When are you going to visit us and have a proper Turkish breakfast feast?? Also I’ve been craving bread pudding and would love love to see one appear on your blog! hey Kelsey, where did you find a pile of figs? Tell me and I also want to find a pile of them! Ugur, that sounds awesome! I’m going to try it. When you have the stew closed in the pot, is it in the oven baking? Or does it just cook in the heat of the water and vegetables? Also, you might try Whole Foods for the figs, at least here they were having a sale on them. I’d love to know what you like to make with figs. I have the same obsession for breakfast 🙂 This rice pudding is over the top! I love love love the sounds of a brown butter fig sauce! Glad to hear I’m not alone! 🙂 Hope you get a chance to try it – the sauce definitely was awesome. I’m not usually a fan of rice pudding, but yours looks so delicious with that sauce that you may have changed my mind. It actually took me a long time to start liking rice pudding too – I used to really hate the texture. I’ve discovered I like it best if it’s really creamy, so often I replace some of the milk with cream. But, it does make for a slightly less balanced breakfast! I’m used to rice pudding for dessert, but I’d love it for breakfast, too. Beautiful pictures. Thanks. I definitely eat it for dessert sometimes too. I tend to make the breakfast version a little less sweet and the dessert version a little more so. (and if you let it cool to room temp before serving for dessert, you can fold in some whipped cream to make it a little fluffier and richer!). oops, I forgot, I simmered it on stove for 2 hours. I’ll send you the whole recipe. You should also try my rice pudding. Let me know beforehand coming to cities and I’ll make for you. In an attempt to eat healthier for breakfast, I recently tried to make a brown rice and milk type porridge, but it was not good. I think if I use this recipe, I will enjoy it much more. I’m going to cook up some rice tonight! Uh oh, pressure! 🙂 I hope you like it. The trick is to add syrup or honey in the amount you like. I also really like the cardamom flavor (big surprise) so sometimes I even throw in a little extra. You are currently reading Rice pudding with brown butter fig sauce at Five And Spice.